After three days in the lonely lagoon we decided it was time to head back into civilisation once more. In a few days we were to meet with Helinä from Finland and Nigel and Tommy onboard Marie, all part of the SBC (Small Boat Club's) Baltic section. The meeting was decided to take place at the restaurant dock at Ornö, mostly because forecasts now started to mention an end to the high pressure weather. There were even first hints of a storm coming through during the week-end. However, before sailing to Ornö we wanted to visit Fjärdlång, an island on the outside of Ornö. We sailed there in light winds and some drizzly rain that started to become more intense as soon as we reached the anchorage. There were quite some boats inside and more were to come the next day. Then Helinä arrived as well. 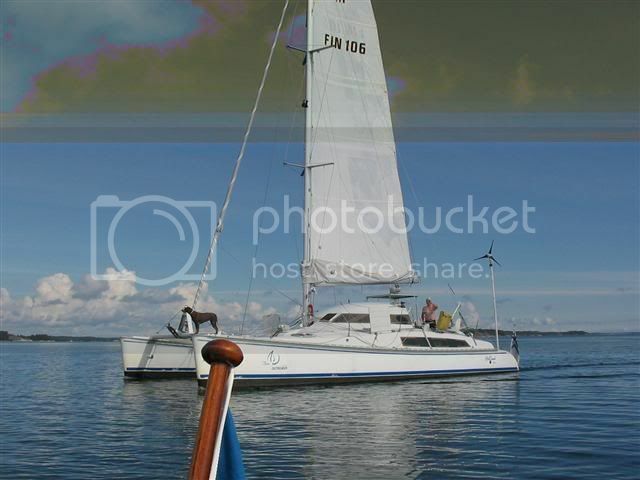 Jukkas catamaran can by no means be described as a small boat, despite him being a member of SBC. He and his crew dropped anchor just inside the inlet. Later they came to visit us with the dingy. We then decided to move Discovery and raft up to Helinä to share dinner in the cat's big saloon. 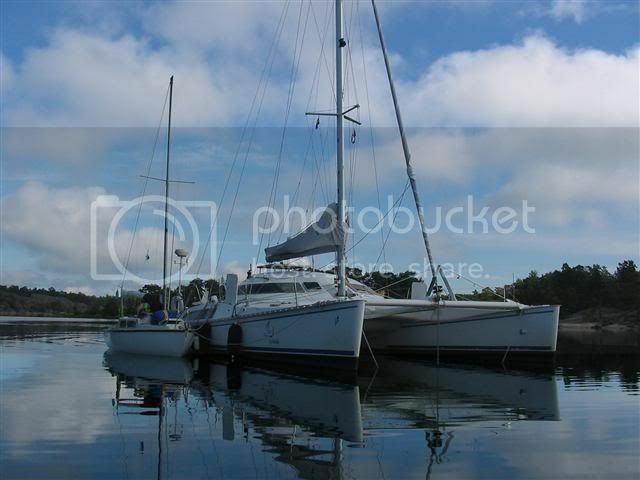 The second picture was taken the next morning when I took Helinä's dinghy out to take some photos of the boats. That morning the winds were light and the weather was sunny, but in the afternoon and coming night the winds were to increase and develop into one of the quite unusual heavy summer storms. 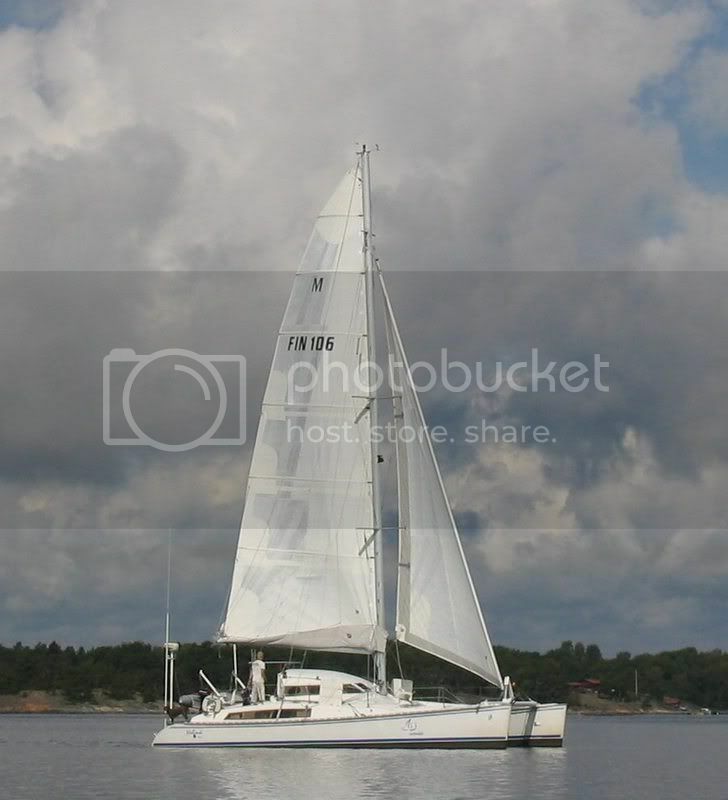 We sailed towards Ornö quite early and in the beginning we took some pictures of the boats under sail. Not too much wind in the sails though. This is Helinä. 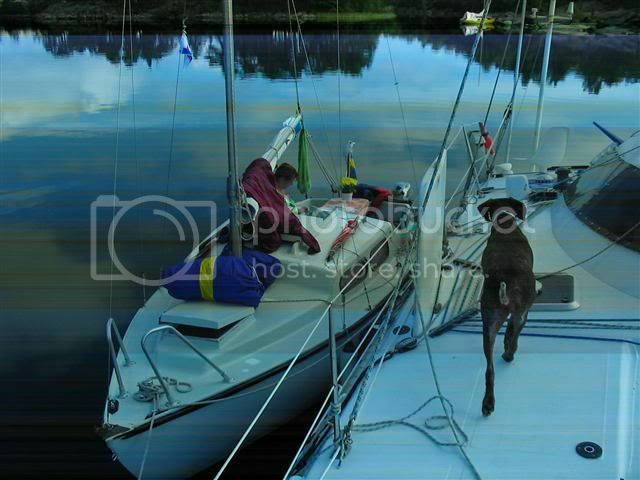 Doggy person in the famous position on the bow. And this is Discovery with her new high jib, taken by Helinä. A few hours after we arrived at Ornö, Marie with Tommy and Nigel arrived as well, just in time for dinner at the restaurant while ouside the storm was starting to get up with rain and heavy winds. The storm in fact increased during the night and Discovery was bouncing around considerably at her mooring. I went out three times during the night to double the lines or secure things or just because I couldn't sleep and it felt good to be doing something. In fact I did realise that Marie's decklights were on but I put that down to them wanting to check their lines as well. However, the truth was they just had forgotten to switch them off, thus effectively draining their battery. 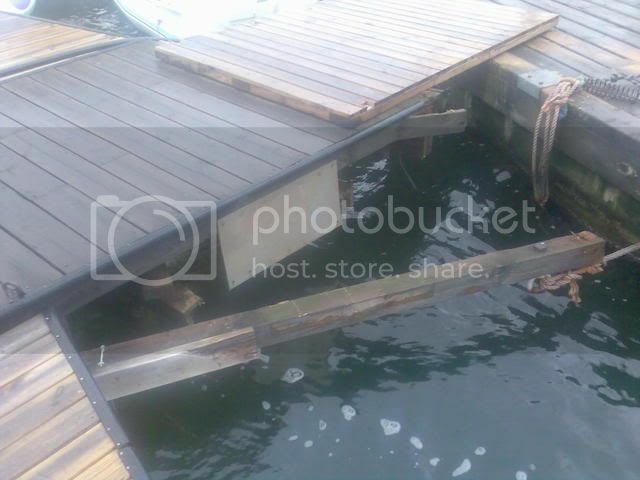 The next morning we found everything still in place, except that Helinä had snapped a mooring ring with bolt out of the dock thus even ripping out the beam it was attached to. Photo by Nigel. After the storm finally abated Helina left for home while Marie and Discovery continued to cruise together some more days. In fact, we just decided to meet at Kymmendö, the same anchorage we visited during the first week of the cruise. Marie went around the outside of Ornö while Discovery first stopped at the next bay to collect a delivery of white wine ordered the day before. This was the first time I used the famous Trouville outboard I got from Tommy who did not want to have it hanging on his boat. Of course I gladly offered to relieve him of it, stowed the little Honda below and hung the big Tohatsu-San on the back, speeding away in 5.1 knots instead of the usual 3.5. The engine in fact was so powerful I had difficulties not to ram the dock at Vargvik the first time I used it. That it immediately tilted up when I put it in reverse did not help either. Otherwise it was a great improvement. That evening we moored both boats to a rock and had a barbeque. It did not rain either. 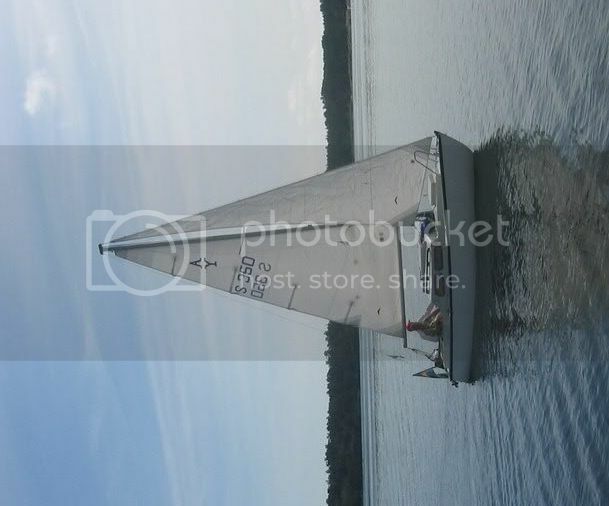 The next day we decided to sail to Härsö again. There was lots of rain in the forecast and Härsö is a good place to wait out some bad weather. However we did not sail together. While Discovery sailed at once, Marie's crew first paid a visit to the Hamburger Bar at Kymmendö. Also Discovery sailed all the way in grand style, in rain, bad visibility (nav lights on even!) and a quite strong following winds. At one time we made 5.5 knots with only the mainsail up. Nigel and Tommy on the other hand, waited in the Hamburger Bar until the rain stopped and then just motored over. In order to charge the batteries. Yeah, right. The next morning Marie left. Weather, at least then, was apparently good enough for crew to be almost naked.